It’s hard finding good keywords and it’s often frustrating to write good content about a topic only to see your post linger on page two of Google. This post is about how to find great SEO keywords that you’re already ranking for to get traffic without much work on topics that you’re familiar with! We’re after guaranteed successes here. In order to do this, you’ll already need to have Google Search Console set-up for your website. I generally recommend having a keyword research tool (such as Keysearch) to verify your findings. This post is for people at the more intermediate level of SEO as you will need to have Google Search Console set-up (and verified). Similarly, it’s easier if you already have some organic traffic. Google Search Console is Google’s own separate area for helping you analyze your search analytics data as well as website rankings. I realize that it’s not natural that it’s separate from Google Analytics, but this is a valuable source of information for helping diagnose website issues that may be impacting your rankings. 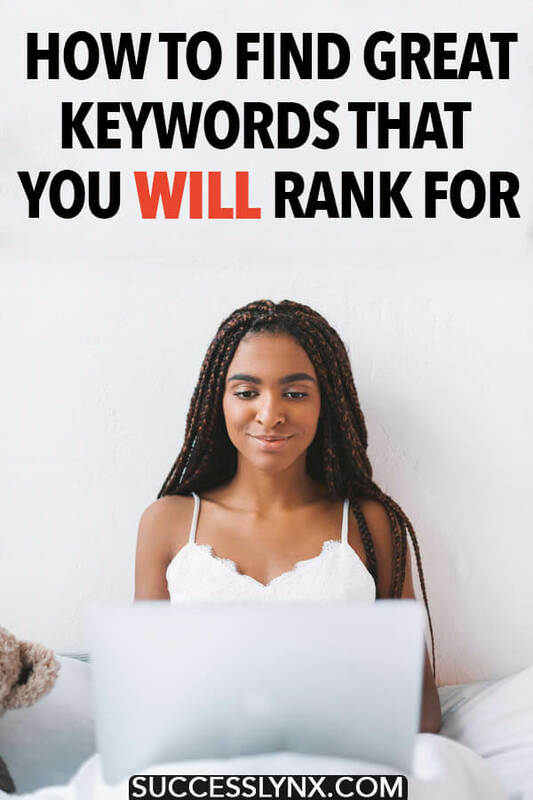 Most importantly, you can check your rankings, the percentage of people who click through to your website from any ranking posts on Google, and what keywords you rank for. Note: You can link your analytics with your Google Search Console to make it easier to view keywords in Analytics, but I still prefer to use Google Search Console separately to take advantage of their graphs. In order to go into your Google Search Console, you should be logging in with the same account linked to your Analytics. From here, press Start Now! Welcome to Google Search Console. Note: From here, you might want to verify that you’re choosing the https:// property (if you have https://) rather than http://. This is a common mistake as you want to ensure that you’re looking at the right data. Click Performance. You’ll see a filter that states the date (usually last 7 days or last 30 days). I like to work with data from the last three months for smaller websites and data from the last month for larger websites. You’ll see two colorful boxes with two white boxes (average CTR and average position). Click these two white boxes to make them colorful, which enables us to see this data on the chart below. (This is not data from my own website, but anonymized data from another.) You can see below what it should look like! From here, you’ll scroll down to where it says queries. The idea here is that you can look at how many people click through to your website after seeing your SEO optimized title and your SEO meta description or whatever Google shows. CTR stands for Click-through-rate. This is the percentage of people/users who click through to your website after searching for a keyword (e.g. query). Your ranking is what position you are on the page, not including ads. This should be assessed together with your average position, which varies by keyword. Let’s say that you rank for the ten day tour of Italy with an average CTR of 10% while you’re in ranking #5. You have an extensive post about this topic and you’re beating the average. The higher that you rank for a certain topic, more clicks that you should get. The majority of the clicks (~50%) generally go to positions #1-#3. If you’re still on the first page, don’t give up hope as sometimes the content ranking for these queries may not be that good and/or fit the query. In that case, people will click through to your content. Now that we’ve briefly discussed how to find your queries in Google Search Console, I want you to scroll through your queries. As you scroll, you might find a query that is semi-related to something that you’ve previously written about, but a bit off. In the case of your ten-day itinerary for Italy, you’re actually ranking for a week itinerary for Italy. Your content isn’t about this, but Google thinks that your content is a good fit. At the end of the day, the most important thing that you can do is to write high-quality content that is well catered to user intention. If someone searches for vegetarian food in X city, they’re not interested in vegetarian food in the entire country or a meat-obsessed food guide to X city. This user looking for a specific post that will help them find relevant restaurants near this city. This strategy is about thinking about whether your content is helpful to the topic and answers their question. Be critical in thinking on whether your post caters well to the topic. I prefer queries within the #5-#20 ranking slots as these have the most potential for easy traffic as Google already likes my content on this topic. You can more easily click the position header to sort by position. You might need to click back quite a bit to see the lower ranking queries. The idea here is that rather than trying to poach others’ keywords, I look at keywords that I already rank for with content that isn’t well suited to the current keyword. Similarly, I also consider topics where I could write more in-depth as well as related keywords that I haven’t written about in full with poor click-through rates. This is often the case with secondary keywords that arise in your writing and/or variations on your topic, rather than keywords that you’ve actively written content for. For instance, I may have written about a guide to food in X and only briefly discussed vegetarian restaurants in X. However, I am ranking for vegetarian restaurants in X in slot #10. Let’s say that my guide to food in X has a big picture of a steak as soon as you come onto the page. You can imagine that vegetarians and vegans might click off and head to another website. In this case, you’ll want to write a specialized post specifically about vegetarian restaurants in X. This should be a winner as you already rank for it and Google already likes your food coverage about this topic. The strategy behind this method is that you’re further building your content about a topic that Google already recognizes you as an expert on. (This is the basis of the Wolf Pack Method, my SEO strategy that focuses more on content creation.) Similarly, you’ll also be improving the rankings as well as the click-through rate for content that could be better. I usually like to check the competition on a keyword using a keyword research tool before I commit to writing about a topic. A certain topic might not be that well searched, so it’s worth checking first. If it looks good and I’m ranking wrongly for something that I haven’t written about extensively, it’s a good sign. As soon as I create a new post about a topic that I rank for that I shouldn’t rank for, I usually scan the old post for the keywords that I wrote new content for (e.g.. a week in Italy itinerary) prior to ensuring that this is not included in the SEO description or title of the old post. My new post will cater specifically to this topic and I only want the new post to rank for this query. I hope that you find lots of great keywords about topics that you’re passionate about! Let me know what you thought about this keyword strategy!